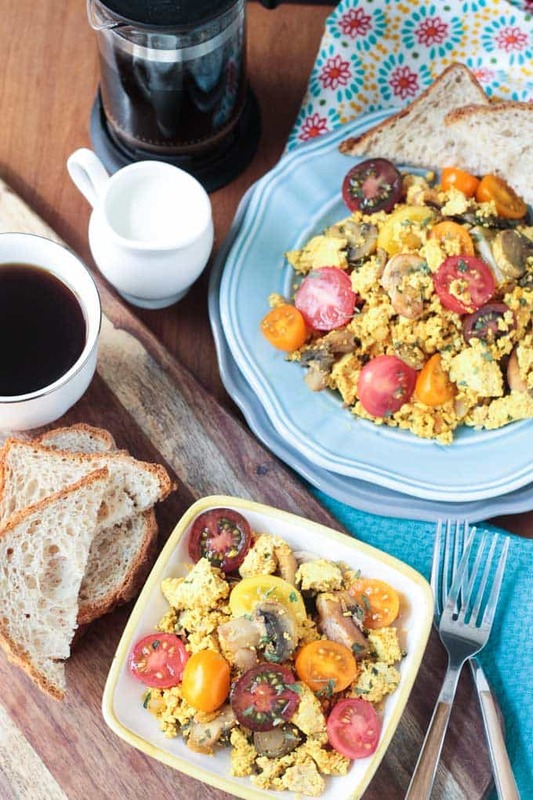 Easy Tofu Scramble with Mushrooms – a protein packed, plant based breakfast to get you through your day! Breakfast has always been my favorite meal of the day. When my hubby and I were first dating, my favorite date was a late morning brunch: sitting and talking while sipping on cup after cup of coffee and indulging in hearty breakfast fare. We continued these brunch time dates even after we were married. A lazy Sunday morning being our favorite time for a brunch outing. After a filling meal, even with all that coffee, naps were desperately needed later in the afternoon…which was fine when we only had to take care of ourselves. But breakfast is said to be the most important meal of the day, so I doubt it should leave me wanting to curl up and do nothing. Thank goodness for this easy tofu scramble! Now that we have kids, brunch at a restaurant is not quite the relaxing atmosphere it used to be. And my food choices aren’t the usual eggs, hash browns and bacon either. But sometimes, I do crave a good scramble. Enter – tofu! Firm tofu crumbles easily to resemble eggs and you can season it with anything you like. I always load it up with lots of fresh veggies and a few seasonings. 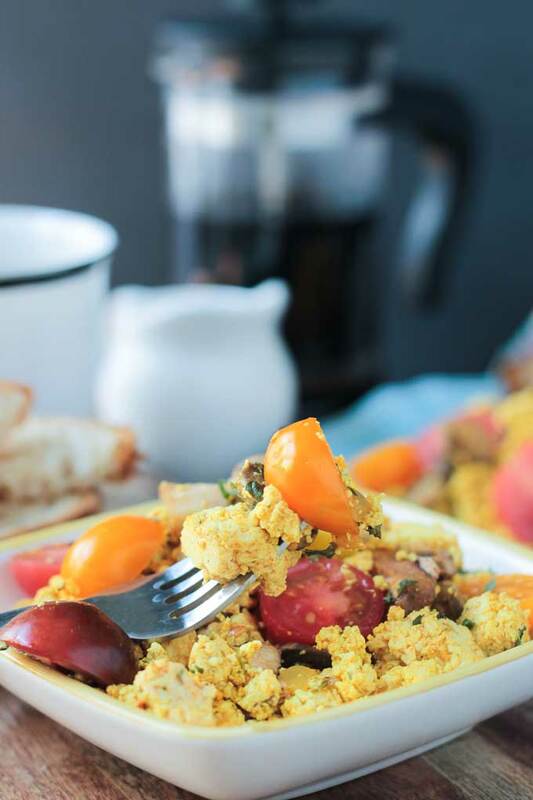 You will probably be hard pressed to find a tofu scramble on most restaurant menus, but luckily for you, they are quick and easy to make at home and won’t leave you feeling bloated and sleepy. 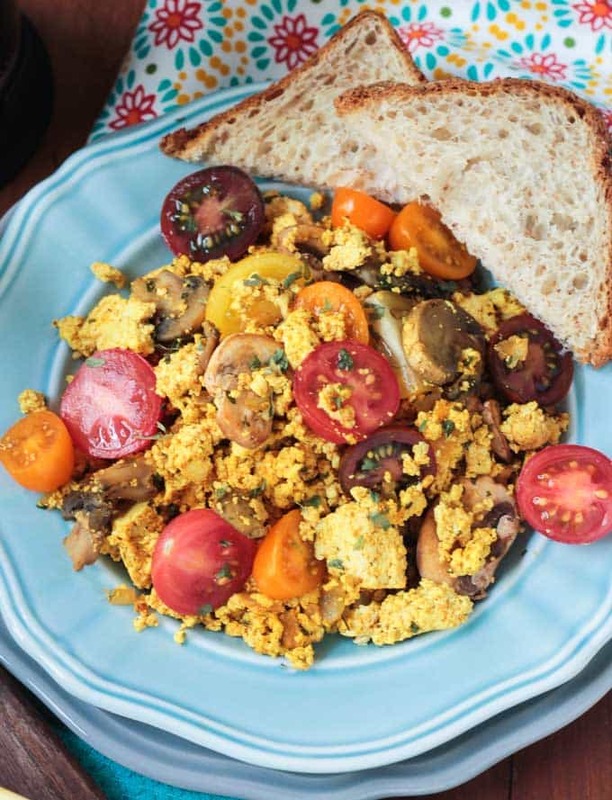 My favorite is this Easy Tofu Scramble with Mushrooms. Tofu is super high in calcium – 77%! It also boasts lots of manganese, copper, protein, omega-3 fats and iron. Just be sure to get non-GMO organic tofu. Mushrooms are a good source of B vitamins, potassium, selenium and antioxidants. Tomatoes are high in vitamin C, vitamin K, vitamin A and much more! If that weren’t enough, this easy tofu scramble is flavored with lots of spices – no bland tofu here! 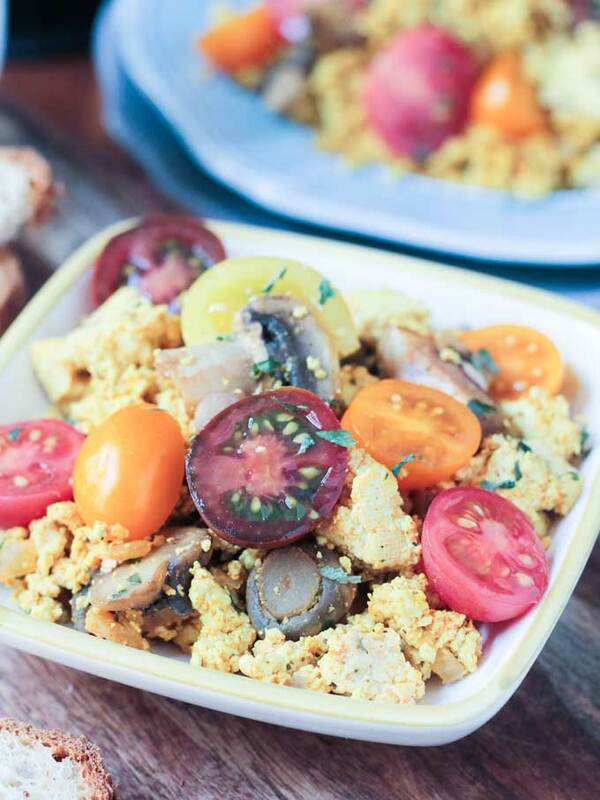 Give this easy tofu scramble with mushrooms a try next time you are craving a hearty breakfast! If you try it, please come back and leave me a comment below with your feedback. You can also find me on social media. Be sure to tag @veggie_inspired and #veggieinspired so I’m sure to see it. Enjoy! 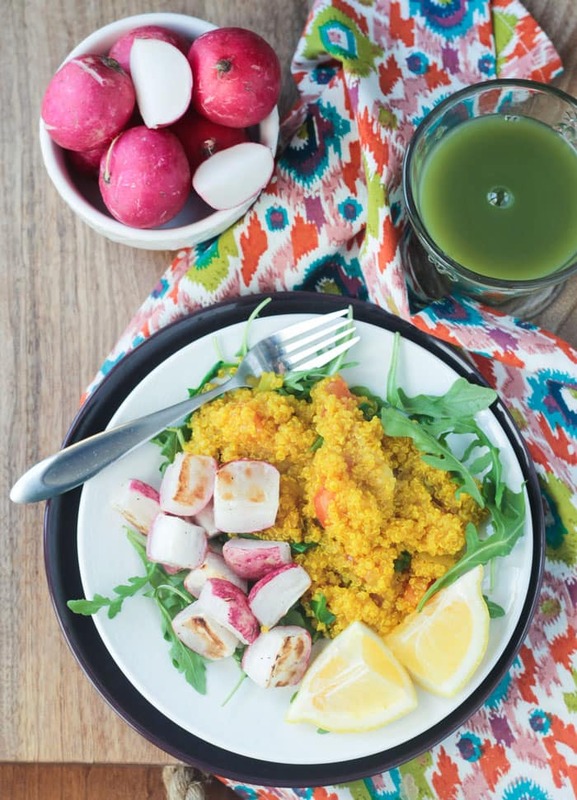 A quick, easy and high protein vegan breakfast. If you haven't already, drain your tofu and press it for at least 20 minutes. I wrap my block of tofu in a paper towel and put it on a plate. I put another plate over the top and weigh it down with bags of dried beans. Easy! In a skillet over medium heat, sauté onion and garlic in 1 tbsp water for a few minutes until soft. Add the mushrooms and saute until they reduce in volume. Crumble the tofu into the skillet, add spices and stir to combine. Cook for a few more minutes to heat through and let the flavors meld. Take off heat, add tomatoes, stir again to combine. 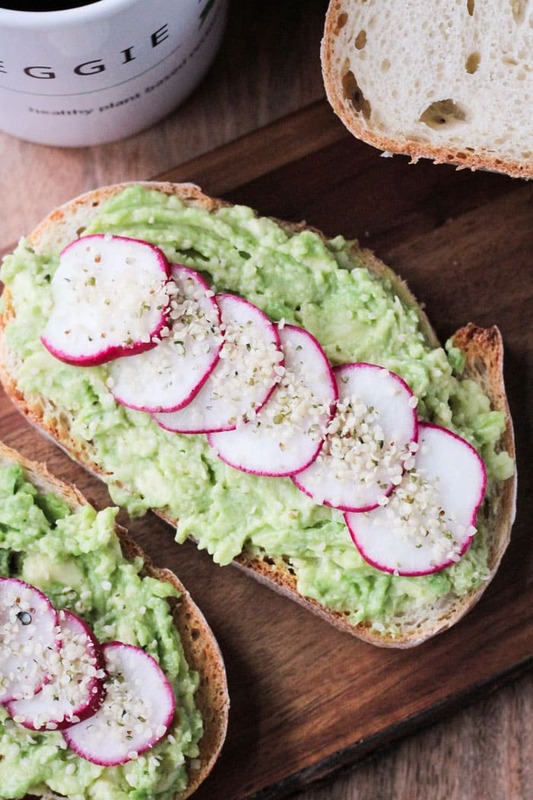 ~Serve with a side of roasted potatoes or whole wheat toast and jam and hot coffee or tea. Brunch is just the best! I haven’t made a tofu scramble in ages. I need to change that. Brunch is my fave! Thanks, Mel! A great recovery meal after a long run. 🙂 Thanks, Linda! Thanks, Sina! It’s a hearty one! How beautiful!! And a great way to get some healthy veggie based protein. I could imagine eating this for any meal! For sure – it would be great for lunch or dinner too! You could even stuff it in a pita or wrap! Thanks! This looks so delicious! Eggs are always my favorite choice for breakfast, especially paired with mushrooms! I always put turmeric in my eggs too, yum! I’m sure this would work just as well with eggs too. Let me know if you try it! Thanks, Emily! Breakfast is definitely my favorite meal of the day and I truly believe it’s also the most important. I would be thrilled to start my day off with this beauty! Packed with flavor and protein, what more could you ask for? I agree! Breakfast is the best! And as much as love a sweet breakfast, I definitely feel better during the day if I go the savory route! I should know better than to read your blog late at night when I’m hungry! Tofu scrambles are the best, especially when you add all that good stuff to it like you did. HaHa! Well, if you like this, you should today’s post! Breakfast Tacos featuring this scramble plus crispy roasted potatoes!! 🙂 Thanks, Nicole! Believe it or not, I’ve never had tofu! I do LOVE breakfast though, so this looks amazing! This tofu scramble looks so delicious! I would love to have this for breakfast! I LOVE brunching it after a morning hike on Sundays. I havea few vegetarian clients who would love this dish. Me too! Sunday morning brunch is my fave. Before kids, my hubs and I would go for a long run and then out for brunch. So fun! Oh my gosh this looks delightful! I have a package of tofu in my refrigerator as we speak. 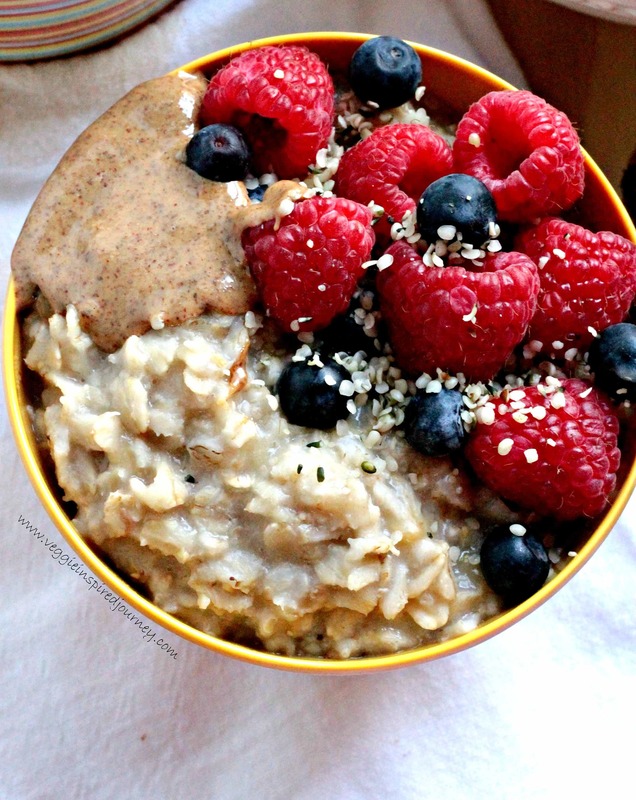 This is a great breakfast for mornings when I need serious fuel! Yes, protein packed for sure! Thanks, Chrissa! Enjoy! OHHHH i so needed this today!!! I’ve been missing eggs again and had totally forgotten about yummy tofu scrambles!!! I am so going to do it this week. I love a tofu scramble – can’t wait to try this one! Thanks, Becky. I love a good savory breakfast!